Everyone knows the story about when Moses ate some psychedelic mushrooms and saw god in a burning bush (or something like that). 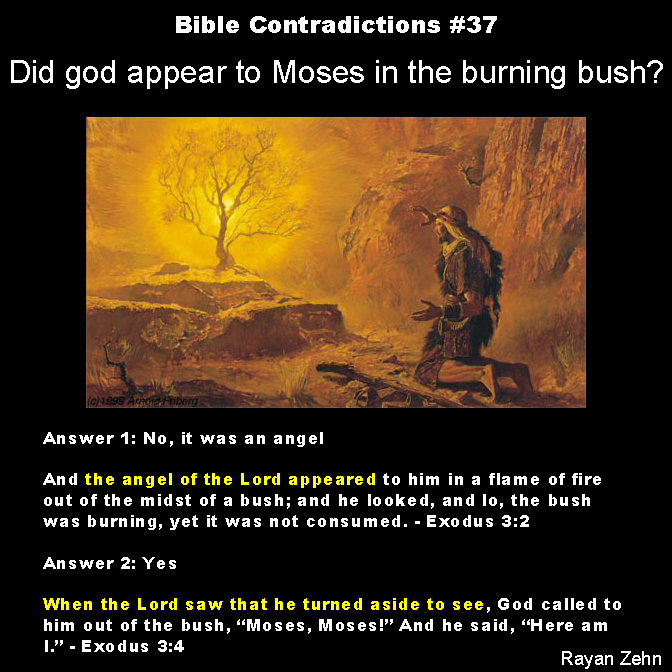 But not everyone knows that the bible is confused about whether or not it was god or an angel in the bush. (Don’t worry. It’s just a fantasy tale). First in Exodus 3:2 the bible is quite clear. It was an angel in the bush. This is reinforced by Acts 7:35, which states that god sent an angel down to deliver a message. Apparently god was too busy to do his own dirty work, so he set a pyromaniacal angel to earth and told him to hide in a bush. But then we look at Exodus 3:4 and see that the angel suddenly disappears and is replaced by god, who delivers the message to Moses. Of course, this is not explained in the bible. In one sentence Moses is looking at an angel, receiving a divine message, and in the next the angel is inexplicably absent, god in its stead, message in hand. This is supported by Mark 12:26. In other words, in merely two verses the bible gets confused, saying it was both an “angel of the Lord” and god himself. And both verses have supporting verses found in the New Testament. The NT didn’t even catch this contradiction and try to fix it. It merely repeated the mistake. This entry was posted in Atheism, Bible Contradictions and tagged Atheism, Bible Contradictions, Christianity, Christians, contradictions in the bible, God, God of Abraham, Moses, Religion, the bible. Bookmark the permalink.